The UFV Cascades went walking through Abbotsford on Saturday, Dec 17 and Sunday, Dec 18, knocking on doors for donations of non-perishable items for the Abbotsford Food Bank. Filling 21 boxes with food, the project was deemed a success. The walk and knock was headed by Alexa McCarthy, a third year Kinesiology major from Chilliwack, and her teammates on the women’s basketball team. “Besides women’s basketball, we had help from the rowing, women’s soccer and men’s volleyball teams, it was a great department effort,” said McCarthy. 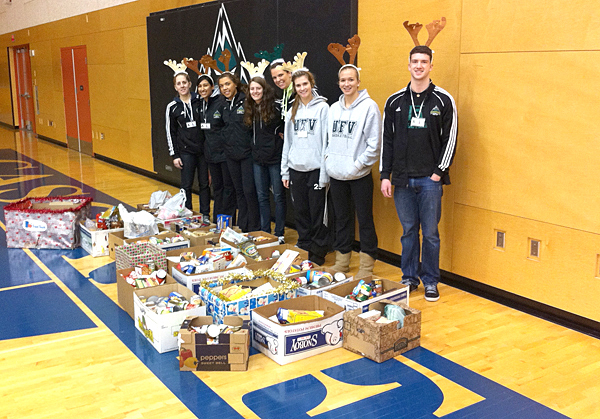 Boxes will be set up for donations in the Envision Athletic Centre lobby in Abbotsford until Wednesday, Dec 21.